Deliciously Fun Wedding Cake Alternatives — Sweetchic Events, Inc. This cream puff tower make for a light yet satisfying end to the wedding feast. This donut tower also offers bit-sized portions, but with a whimsical twist. You might want to embrace the modern "dessert table" trend with a selection of ALL different types of goodies! You may even choose to add a traditional wedding cake to the table too! 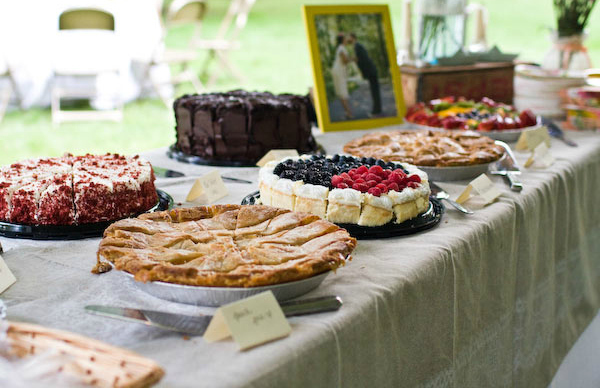 For those with a slightly more rustic-themed wedding, a pie bar would fit the bill. One of my favorite ideas is to serve multiple mini-cakes that pull double duty as table centerpieces! Having a summer wedding and looking for a treat to cool down? A vintage ice-cream cart is cute and delicious! Are you having a wedding cake, or are you opting for something completely different? If you're already married, would you try this new trend?